Program note: Hillary Clinton will discuss her memoir "Hard Choices" in a town hall meeting at the Newseum in Washington at 5 p.m. ET on June 17. The former secretary of state, senator and first lady will take questions from moderator Christiane Amanpour, CNN's Chief International Correspondent, and members of the audience. The town hall will be simulcast on CNN International and CNN en Espanol. 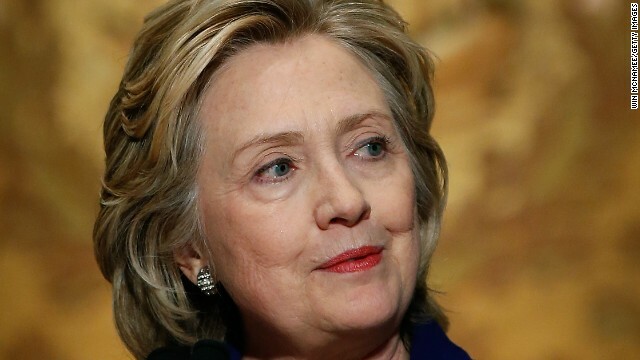 Washington (CNN) – A majority of Americans still see Hillary Clinton in a positive light, but a new national poll indicates the former secretary of state's favorable rating has edged down since earlier this year. As Clinton kicks off her book tour of her much anticipated memoir, "Hard Choices," a Gallup poll released Wednesday indicates that 54% of the public holds a favorable opinion of her, down five percentage points from February. The 54% figure is the lowest favorable rating for Clinton in Gallup polling since August of 2008, just two months after the then-Sen. Clinton of New York lost a marathon and historic battle for the Democratic presidential nomination against then-Sen. Barack Obama of Illinois. Obama named Clinton as secretary of state, and her poll numbers soared as she served as America's top diplomat, a non-political position in the eyes of most Americans. Her favorable ratings started to edge down last year after she left the State Department and began considering another bid for the White House. "Hillary Clinton's era of higher favorability appears to be ending even before she announces whether she will run for president. Americans typically rate non-political figures higher than political ones on this measure, and her favorable ratings before, during, and after being secretary of state are consistent with that phenomenon," says a release from Gallup. The poll indicates an obvious partisan divide, with 90% of Democrats saying they see Clinton in a positive light. Her favorable rating drops to 49% among independents and just 21% among Republicans. The survey supports the conventional wisdom that Clinton's husband, former President Bill Clinton, would most likely be an asset if she decides to launch a 2016 bid for the White House. Sixty-four percent of Americans say they have a favorable opinion of the former president. According to the survey, two-thirds said Clinton is a strong leader; six in 10 said she was honest and trustworthy; and majorities said Clinton understood people like them and had new ideas for the country. The numbers on Clinton's personal qualities matched a CNN/ORC International poll conducted earlier this year. Of course, there was a partisan divide on all of those questions. The Gallup Poll was conducted June 5-8, with 1,027 adults nationwide questioned by telephone. The survey's overall sampling error is plus or minus four percentage points. The ABC News/Washington Post poll was conducted May 29-June 1, with 1,002 adults nationwide questioned by telephone. The survey's overall sampling error is plus or minus 3.5 percentage points. and the truth is.. No matter WHO is elected to office... They will ignore the promisses made about any beterment of the people.. And fall over them selves for the big money back rubbing.. To the highes bidder who funded them..
Mark my words, if Hillary gets the democratic nomination she will lose. Sorry, but she was a shoe-in 6 years ago but a relative unknown beat her....why? Because she isn't that engaging on her debates, women don't seem to care about her and some men won't vote for a woman (I'm not saying these things to be sexist either). She is unelectable...polls mean nothing, Bush Sr had high 80% marks 1 year prior to the 1992 elections and guess what? He lost. Polls mean nothing if people don't like you. Clinton was liked, Reagan was liked, heck....even Bush Jr was liked (by repubs) same with Obama (by Dems) but Hillary is not liked period. Her daughter would have a better chance running than her. She needs to really stay home ans enjoy her new grand child. the country would be a whole lot better off. cover up her past and her positions. We know who she is. The reasons Hillary must not be president has nothing to do with all the fake scandals,her age,etc., and everything to do with her being a corporate-centrist career politician who has no intention of challenging the plutocracy that she is now a part of. What is needed are deep-rooted overhauls of all our established institutions; nothing will change trying to work within the system, it has been proven time and time again.
. I voted for Obama in 08 hoping for change. We got change, but not positive change. I would sweep everyone out and start anew. The unknown could not do worse than the current administration.